The application involved heating a steel washer to 200 ºF (93 ºC) to enable adhesive curing. This heating application will be part of an automated manufacturing process for an automotive industry part. The Ambrell Application Laboratory did testing and determined an EASYHEATTM 2 kW, 150-400 kHz induction heating system equipped with a remote workhead would be optimal for this application. A single position, one-turn helical induction heating coil was designed for the application. The part was suspended over the helical coil by approximately 0.125” (3.2 mm). The power was turned on for 1.5 seconds. 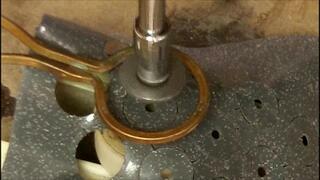 The part was pressed through the gasket material and against a hard surface, which completed the process. At this point, it was observed that the entire surface of the gasket material was shiny, which indicated a liquid/plastic state. Speed, the minimal footprint required by an EASYHEAT induction bonding system, and the repeatability of the process designed by THE LAB factored into the client's decision to leverage induction from Ambrell. Additional bonding applications can be found on the bonding application section of the Ambrell website.